Explore the great outdoors with the 2019 Heartland Cyclone 4005! Satisfaction with the nation's lowest price of Cyclone RVs is found at Lakeshore RV Center. As the #1 Michigan RV Dealer, we aim for exceptional customer satisfaction. That's why we help you along every step of the way to finding the perfect RV for you! Learn more about why the 2019 5th Wheel Toy Hauler may be the perfect RV for your needs by calling us at 231-788-2040, or by visiting us at 4500 E Apple Ave Muskegon Michigan 49442. Come on down to 4500 E Apple Ave Muskegon Michigan 49442 to see this beautiful Heartland Cyclone today! Everyone in the family will relish the spacious interior! 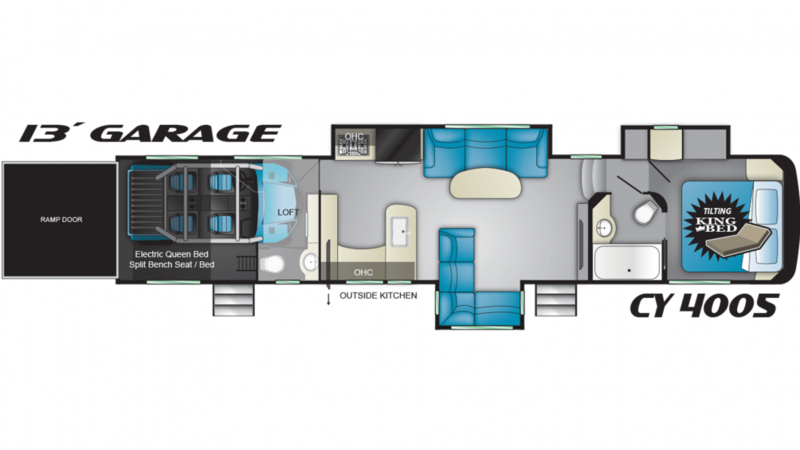 It's a roomy 44' 1" long, 8' 5" wide, and the 3 slides maximize the interior living space! And when the weather outside isn't cooperating, you'll stay cozy and comfy thanks to the modern 15000 BTU a/c unit and the 35000 BTU furnace that will keep the climate in this RV pitch perfect! It's hard to get a good night's rest when you're on the road. That's why this RV has an extra comfy King bed in the master bedroom, so you can sleep like royalty at night! A family of up to 8 can sleep well in this RV! The kitchen offers plenty of fresh water, with the 100 gallon fresh water tank. The 18.00 cu. ft. refrigerator offers somewhere cool to store your food during the trip. Cook up a satisfying meal with the 3 burner range cooktop! There is a sanitary Porcelain Foot Flush toilet and a spacious shower inside the bathroom, so you'll never have to make a trip to the communal bath facility again! There are 60 lbs. of LP tank capacity, so you can have your showers be as hot as you want them to be! You don't have to deal with used water and waste while you're having fun on vacation, thanks to the 80 gallon gray water tank and the 80 gallon black water tank! Want to bring your favorite toys to the campground? You can fit your kayak, dirt bike, or other outdoor toys in the 13' 0" garage! There is a cargo capacity of 3222 lbs, so you don't need to worry about whether or not your heavy luggage can come with you on the road. Whip up your favorite meals out in the fresh air! The outdoor kitchen makes summer cookouts and tailgating fun and easy! This 2019 Cyclone 5th Wheel Toy Hauler has so much to offer, including a half-bath for convenience and comfort. The Porcelain Foot Flush toilet is easy to use, and with a 80 gallon black water tank, there are no worries! The 2019 Heartland Cyclone 4005 features 2 beds and one of the nicest accommodations is the roomy loft bed. It's spacious and comfortable, and the kids especially will love climbing up and snuggling in for a great night's slumber!